I feel like it has been so long since I posted. So much has happened these past few weeks. There are so many things I want to write about, where do I begin? We attended the One Small Step walk for the Foundation for Prader-Willi Research, we had a doctor appointment with a neuro-opthamologist, and, drum roll please…Peyton sat up on her own today!!!! A few weeks ago, we attended the One Small Step walk for Prader-Willi Research. It was amazing to be a at the event, to meet other families and children. We met some wonderful families who had children with PWS who were thriving. We were able to talk about new developments, and the impact of early intervention. This event was so positive. A couple weeks ago, we had an appointment with the neuro-opthamologist. Children with PWS can have trouble coordinating their eyes, a condition known as strabismus or crossed eyes. Prior to our appointment with the doctor, I made sure that I prepared myself for any outcome. We know that there are potential challenges that can come up thoughout Peyton’s life and I now that I have to prepare myself so that I do not fall apart when we are faced with a new challenge. We know that there is power in knowing. That knowledge helps us move forward and face the challenge directly. Well, I am so happy to report that there is nothing wrong with Peyton’s eyes that is related to PWS. 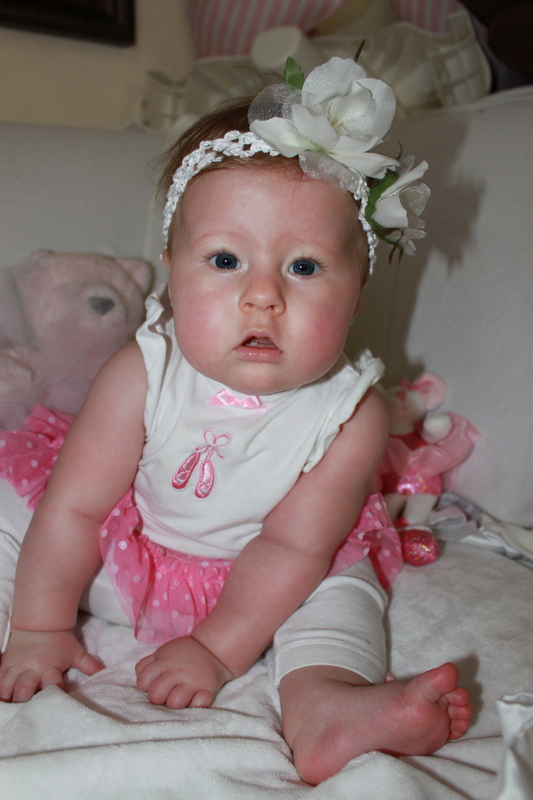 She has a couple of astigmatisms that are symmetrical, good sign, and we will recheck her eyes before kindergarten. We were thrilled, absolutely thrilled. Peyton sat up on her own today!!!!! I want to keep saying it because it makes me so happy. Peyton sat up on her own today! She just woke up today and decided that it was time for her to sit up. You can see that she is so proud of herself, but not nearly as proud as her Mom and Dad. I cannot put into words what this means to us, to see Peyton thriving. This is a time of year to be thankful, to remember everything that we have in our lives to be grateful for. I am so grateful for our life, for our kids, for our family and our amazing friends. I can honestly say that I have never had more in my life to be grateful for. For that reason, this will be the most amazing Thanksgiving. I wish all of you a wonderful Thanksgiving full of lots of love, joy, and an abundance of thanks. Lots of love to all of you. Renee, I just read your blog and I am excited beyond words!!!!! It brought tears to my eyes. I was so excited yesterday when you told me. It put some bounce in my step, it made me start singing and thanking the Lord for answering my prayers! All the other things in life are so minuscule. It sure makes you put things into perspective. I am so proud of you! How exciting! So much love in the Snyder household, it is very inspiring! Peyton looks beautiful as ever. LOVE You! What exciting news! Love the picture. You are such an amazing mother and I am humbled by your strength, love and courage through this journey of motherhood. Sending you a big hug and lots of kisses to P and C!